Constants are those value do not change during the execution of the Program. Variables are those whose value can be changed during the execution of the program. Identifiers are programmer designed tokens. They are used for naming classes, methods, variables, objects, labels, packages and interfaces in a program. They can have alphabets, digits, underscore and the dollar sign characters. Uppercase and lowercase letters are distinct. They can be of any length. Names of all public methods and instance variables start with a leading lowercase letter. When more than one word is used in a name, the second and subsequent words are marked with leading uppercase letters. 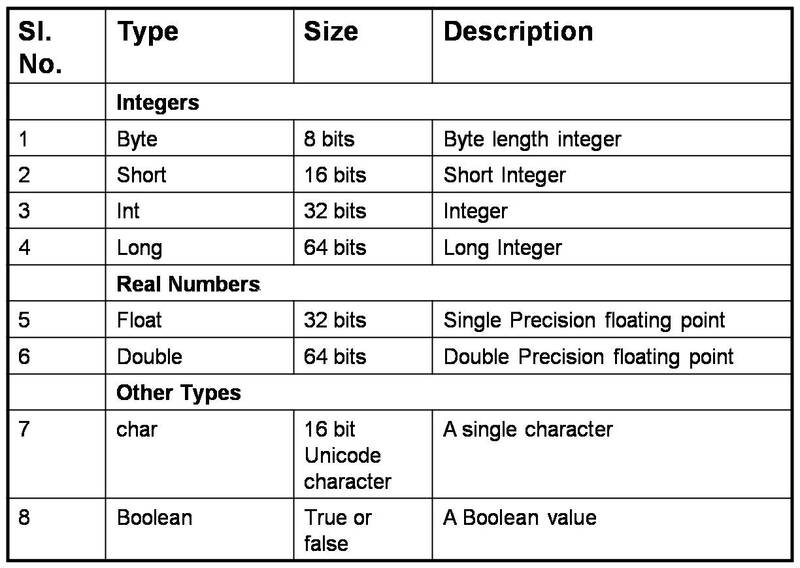 All private and local variables use only lowercase letters combined with underscores. All classes and interfaces start with a leading uppercase letter and each subsequent word with a leading uppercase letter. op1<<op2 ; shifts bits of op1 left by distance op2. Left shift operation is multiplication by two operation. op1>>op2; shifts bits of op1 right by distance op2. Right shift operation is division by two operation. When more than one operator is used in an expression, then an operator precedence rule is followed to determine the order in which the operators are executed.